As someone who collaborates with a comic book professional, it would be nice to understand his job. And as someone who reads a lot of comic book it would be nice to fully understand what goes into the creation of the final product. And as someone who loves Archer & Armstrong, I am more than happy to let writer Fred Van Lente explain it all to me. 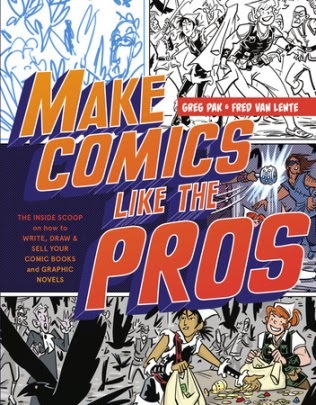 Make Comics Like the Pros: The Inside Scoop on how to Write, Draw & Sell Your Comic Books and Graphic Novels by Greg Pak and Fred Van Lente breaks down the comic book making process for the aspiring professional and the fan. The book goes through the various steps in creating a book from idea to finished product. And they explain the various jobs in the creation pipeline including providing tips for those holding those jobs based on their own experiences. Along with telling you how to make a comic, they show you as they work with an artist to create a new comic in the book’s pages based on their creation concepts. Along with the text, the book is illustrated on nearly every page with a piece of comic art that helps illustrate their points, generally from a Pak or Van Lente project though never from the big two publishers. Now, I am not a comic professional. Though this week I did declare myself the COO of a non-existent comic press. After I made my inspirational speech, my staff seemed to have evaporated. But now I have a toolbox to assist me in bringing everyone back! Okay, seriously, Make Comics Like the Pros has value for those who do not make comics. First, Pak and Van Lente stress the need for collaborating. Unlike a book, a comic book takes several different artists to make the final product occur. And they stress the fact that several people are generally needed and they all need to get credit and get paid. Additionally, they discuss the value of collaboration between writers and artists and how two people can make something even stronger. As someone who writes with a team non-comics it was both validating and instructive. Second, for a comics fan there is a nice summary of what each artist does. Their book helps illuminate what an editor, inker and letterer does and some of their general tools. Though they do not share any Marvel art, the two discuss the Marvel Method of comic book writing. This method sees the writer giving a plot to an artist and then afterwards filling in the dialogue and narration. They explain the fear around this method, but also how it can be beneficial. For some this method is liberating and not as terrifying as it seems. For those who want to crack into comics they do discuss how. And the big key is writing stories, your stories. They remind us that Marvel and DC own their heroes, and own your work if you write for them. They do not hire people who send unsolicited pitches. And the best way to get their attention is to write your Avengers story with a team that is yours and not the Avengers. If anything, Make Comics Like the Pros could have used more illustrations from Archer & Armstrong. Okay, that is me showing a bias. For those who want to get into comics or are interested in how a comic is made this book will be of interest. For those getting paid in the industry, it may seem like information that is already in their toolbox. But again, for a fan this is a quick, illustrative read that is fun.